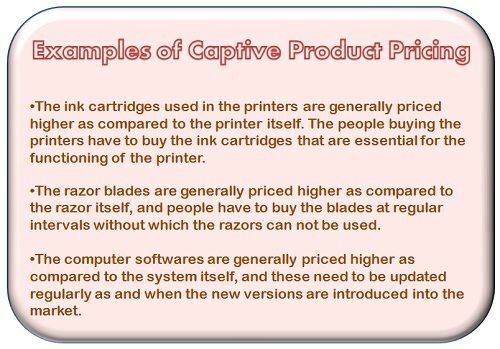 Definition: The Captive Product Pricing is the pricing strategy adopted by the marketers wherein, the price of the core product is generally kept low, whereas the captive products are highly priced. The Captive Products are the products that are specifically designed to be used with the core products, or these products are necessary for the functioning of the core product. This strategy is adopted by the firms to attract the customers for the low priced core products and make revenues from the markup added to the captive products. Attract more customers for the low priced core product. With the increased customer base, the sale of a captive product also increases. The increased long-term revenues, with the repetitive sale of captive products. Keeping the customers hooked with the same brand due to the specifically designed captive product. Establishing the customer loyalty due to a long-term relationship with the brand and thus helps in attracting the customers even for the unrelated products launched by the firm. The customers may create a negative feeling for the core product since they have to make the perpetual payments to facilitate its functioning. The exorbitant high price for the complementary product can spoil the brand image, thereby resulting in huge losses for the firm. The companies should continue to offer the new components or the latest versions, so as to maintain the sale of the core products. Thus, the captive products are generally the accessories or the main component of the core product that is essential for its functioning and has to be purchased every time it is consumed. Thus, the companies make huge profits from the captive product pricing, by keeping the prices high for the products that are to be consumed at regular intervals.